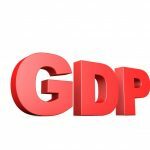 Usually the gap between GDP and potential GDP (what GDP would be if all economic resources were fully utilized) is very small. However, during 09Q2, the gap hit $935 billion; 6.5% of GDP. That was the largest gap since 82Q4 when it hit 7.9%. Since mid-2009 the gap has steadily shrunk and is now actually negative, meaning the economy is overperforming! This is why inflation is expected to rise.